Hi! My name is Jordan Wilson, I’m a Senior at Cosby High School in Midlothian, VA. I’ve been an activist in YST for 3 years, and have served as a member of our State Leadership team for 2 years. On December 15th, I had the opportunity to be apart of a Great Starts with breakfast event at Hopkins Road Elementary School. Myself, along with 10 other Y-Sters from across the state, helped set up for grab n’ go breakfasts as well as participate in Breakfast with a Buddy! 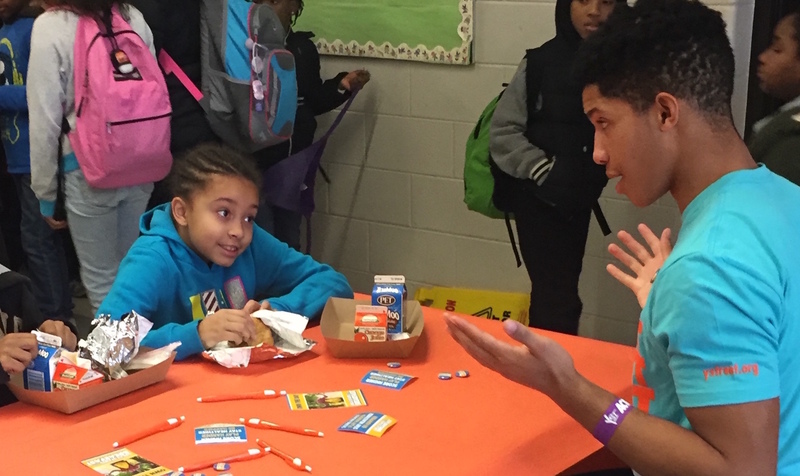 Getting to work on the Great Starts with Breakfast campaign is always an enjoyable time but, it was sharing that meal with the kids at the school and carrying on conversations, making sure every student had a breakfast and a buddy to share it with – that was the best part! I distinctly remember thanking the lunchroom via mic. for allowing us to be there that day and how enthusiastic all the kids were in thanking us for being there as well. The event was one of my favorites by far, and carried meaning that far outpaced the event itself. Getting to interact with kids and learning about how breakfast was important to them taught me that this campaign wasn’t only made to help kids of all ages, but breakfast is desired by all age brackets. This event has impacted the lives of several students at that elementary school and the positive impact continues in schools with similar alternative breakfast programs statewide; allowing students to explore the importance of breakfast and its impact on their school day!